Here, we identify ten common tender spots on your car that any reputable dealer or mobile mechanic will help you look after, avoiding costly replacements. Engine management: Because of emissions regulations and the subsequent introduction of catalytic converters, Electronic Control Units (ECUs) are now more complex than ever before. ECUs are generally sealed units and repair is often impossible. Exhaust systems: Most cars that were manufactured after 1989 are equipped with catalytic converters. If they're not properly checked and maintained and your vehicle needs a replacement, it will hit you where it hurts the most - your pocket. (Because catalysts contain precious metals, replacements are very expensive). ABS systems: These contain a brain, a master cylinder, a pump and wheel sensors. Sadly, all are prone to failure. 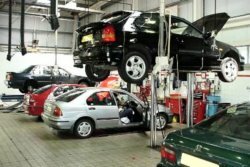 If your ABS fails, even if your brakes are functioning, your vehicle won't pass its MOT. Automatic gearboxes: Many of these appear to be trouble free. However, as the odometer reading increases, so too does the possibility of failure. Most automatic gearboxes are managed by complex electronic systems - which makes maintenance even more of a specialist issue. Electronically-controlled heaters: Push button heating systems can often be found in many executive and prestige vehicles. Stepper motors control air directing flaps throughout the car and, should a stepper motor fail, the system will jam. Unfortunately, the only solution is to remove the dashboard and replace the faulty unit. Power-steering rack: you'll be pleased to know that Power-steering pumps and racks are generally very reliable. However, if they're not correctly maintained and they do fail, replacements can be very costly indeed. Headlamps: Complex computer-designed lenses and fashionable styling have resulted in larger headlamps, while improvements in aerodynamics have made them more vulnerable to attack from debris. A damaged lamp can cost you your MOT certificate. Nose and tail cones: Many modern bumpers are far too fragile to warrant their name. However, these complex plastic mouldings help to provide efficient cooling and stable aerodynamics. Dashboard electronics: Computers, service indicators and other electronic units control vital functions as the temperature and fuel gauges. The printed circuit boards that are part and parcel of these units can, in certain cases, be unreliable. Power accessories: Even the most basic car is nowadays fitted with electrically-powered convenience features. These include things like windows, door-locks, sunroof and mirrors. Switches, motors and mechanisms can fail with age and be difficult and fiddly to replace or fix.